Hello? Are you still there? I know I haven’t been around for a while… so maybe you’ve left. I wouldn’t blame you. I’ve been bantering around the excuse of work keeping me busy and absent from the larder, and that’s true, but to be honest – after so much time had passed between posts – I’ve been terribly anxious about writing to you again. But then there were a few of your lovely selves who said to me and wrote me, saying that you missed me… well, maybe you just missed the food, and that’s ok too. Yes, that’s me. If I don’t laugh, I’ll cry – I really hate having my photo taken, but this was an opportunity not to be missed! A few months ago I was tasked with cooking dinner for some journalists and a man some of you may have heard of, named Hugh Fearnley-Whittingstall – so you know, no pressure or anything! The dinner was to launch the Australian version of the hugely successful series, River Cottage – again, no pressure! 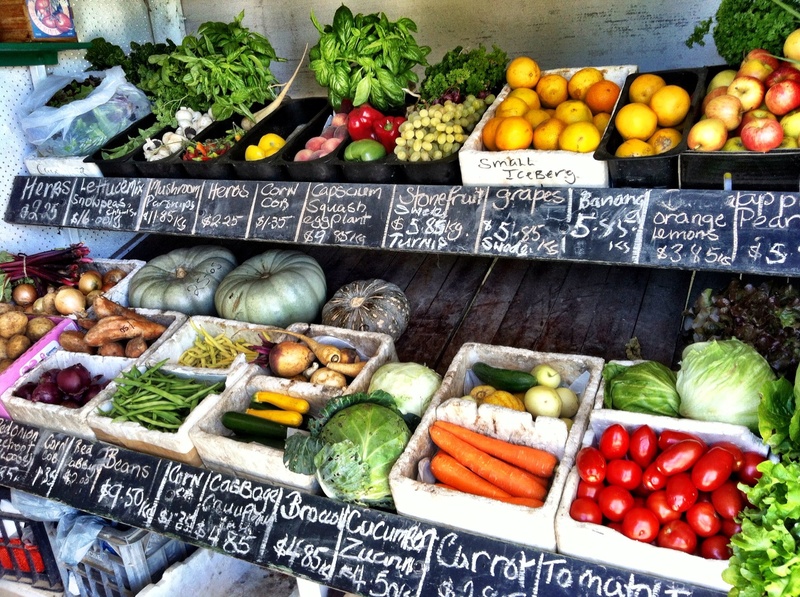 After a trip to the local fish co-op and some sage advice from a friend in the kitchen, I set about scouring the honesty boxes of Central Tilba and the surrounding towns, to see what veg was in season. Plenty of fresh herbs, tomatoes, beans, zucchinis and hazelnuts. And I didn’t need to look much further for inspiration – I had beautiful fresh, local, seasonal produce, and all I needed to do now, was keep it simple (oh, and try not freak out about the fact I was cooking dinner for Hugh!). I’ve been a follower (than sounds better than fan right?!) of him and his work for a while now and there was a moment I shared with him just a few days earlier that to me, was truly special. A few of us had come back from the beach – taking in a sunset swim and snorkel after filming had wrapped. Armed with vegetables from the garden at the farm; freshly caught local black fish; oysters pulled from the nearby lake and of course a few bottles of wine. We were standing in the kitchen (not really a kitchen – no stove, no knives, just a sink and a few pots and pans) of our B&B, deliberating about what to cook for dinner. Normally, you put me anywhere near a kitchen and I’m desperate to get in and take change, but not this time. I was blissfully happy just to be tasked with peeling the potatoes, while Hugh talked through what we could cook with the food we had gathered and the limited resources of the “kitchen”. It might sound like nothing to you, but for me, just to be present and part of his thought process – not reading it from the pages of one of his cookbooks, was such a privilege, and just totally cool! How hard could preparing dinner for 15 people the next night really be?… I was peeling potatoes with Hugh! 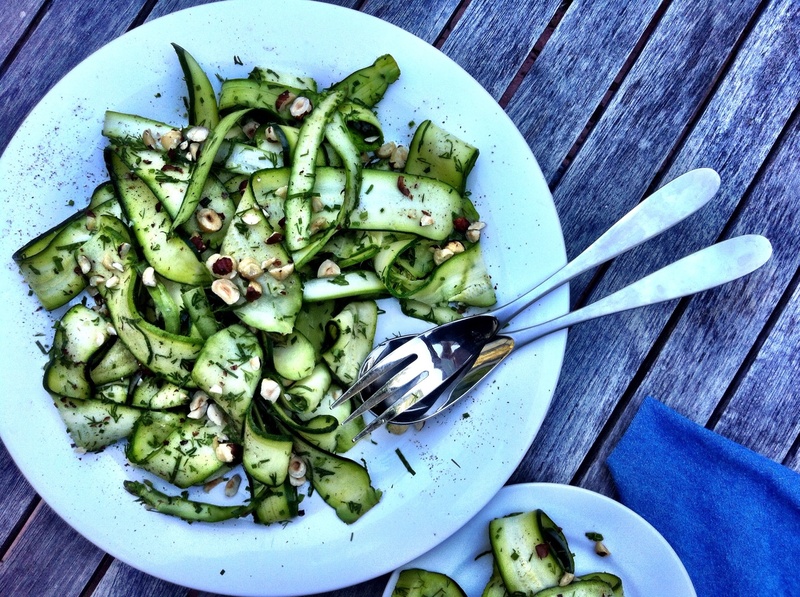 Fast forward 6-months; zucchini’s are back in season, a certain Sydney chef is receiving accolades for “his” raw zucchini salad and this blog post is now well-overdue! Don’t worry, I didn’t just serve salad to my dinner guests, but this was my favourite dish on the table… and it got Hugh’s tick of approval! 05 Nov	This entry was published on November 5, 2013 at 10:25 pm. It’s filed under Delicious and healthy!, Lucy's plate, Recipes and tagged Hazelnut, Hugh Fearnley-Whittingstall, Raw, River Cottage, Salad, Zucchini. Bookmark the permalink. Follow any comments here with the RSS feed for this post. Yum yum, I know what I will be making this weekend!